From Publishing to Reporting, Sprout Social continues to develop new features designed to enhance your workflow. 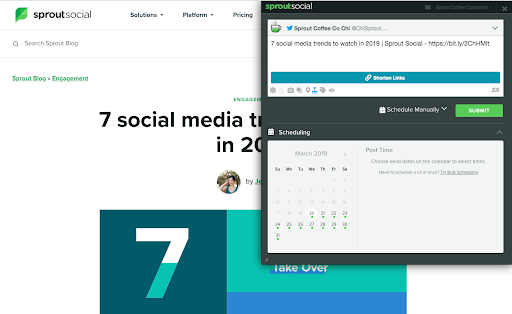 With all of the features available on Sprout, you might be overlooking a few easy opportunities to save time and gain greater insight into your social performance. To help you make the most of Sprout features, our experts on the Customer Support team created a list of 10 great Sprout tips that can help you get the most out of your social marketing. Scheduling to Facebook, Instagram and Twitter all at once saves time, but you may want to change the content to fit the platform. On Instagram, you may want to add your hashtags, but on Facebook and Twitter, you may want to include links to your website. You don’t need to repeatedly copy and paste content to create customized posts for each network. This Sprout feature provides a more streamlined solution: Schedule + Duplicate. You can create your post for Instagram with hashtags, then click Schedule + Duplicate to see the post automatically reopen in your Compose window with any text and attachments. From there, select your Facebook Page, edit the post as you’d like and send it out! 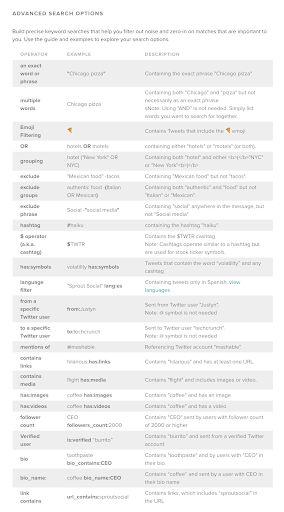 This will also allow you to quickly schedule the same message across multiple Twitter profiles. Open the Compose window > create the post for your first platform(s). Click Schedule and the post will re-open in Compose. Make your modifications > send out the post again. Pro-tip: Use this feature to publish links to Twitter and Facebook. You can delete the URL for Facebook so that only the link preview shows, but include the URL for Twitter to ensure a Twitter Card is created once published. 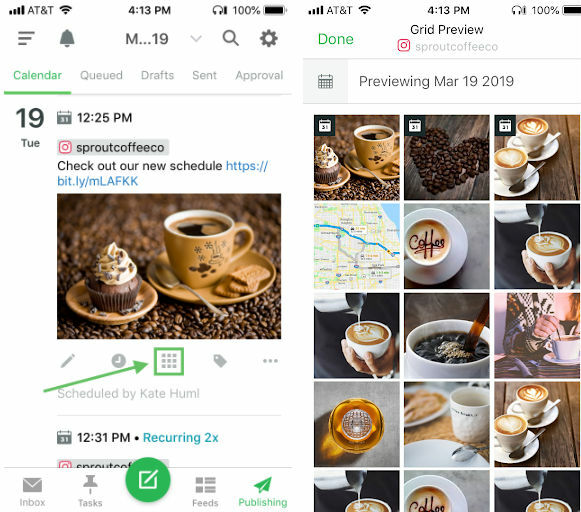 When publishing to Instagram, you can preview your grid by using Sprout’s mobile app. This Sprout feature allows you to envision how all of your posts will look together once published. Open the Sprout mobile app. Click Publishing > Calendar > scroll to find your Instagram post. Click on the grid icon at the bottom of the post. Pro-tip: The grid previews the date that the message is scheduled to publish. To preview all of your scheduled messages on the grid at once, click on the grid icon while viewing the message scheduled furthest out. While we hope that post failures do not happen often, we also know that temporary server errors or formatting issues may cause a post to be rejected by the native networks. To make sure that you do not lose any of your carefully curated content, enable failed message push notifications in the Sprout mobile app. Click the gear icon in the Sprout mobile app > Notifications Preferences > toggle on Failed Posts. If you receive a push notification for a failed post, click on the bell icon in the upper left corner of the Sprout app > Publishing. From there, click on the post under Failed Posts. Edit the post if necessary in the Compose window > then click Send. Pro-tip: You can enable additional Sprout push notifications—like Successful Scheduled Posts and assigned Tasks—in Notifications Preferences on the Sprout mobile app as well. When working from Google Chrome and Firefox, you can install Sprout’s extension to share a link any time you come across interesting content. Click to install the Chrome extension or the Firefox bookmark. Open the extension while viewing a webpage you’d like to share > schedule your post! Pro-tip: While you’re in the Utilities & Goodies tab, take a look at Sprout’s other timesavers, like Keyboard Shortcuts! If you don’t already have Brand Keywords set up on your account, this is one Sprout feature you’ll definitely want to check out. Pro-tip: if you’re running a campaign and your Inbox is crowded with @mentions for that campaign, you can filter them out by creating a temporary Brand Keyword. For example, if Sprout Coffee Co. has a campaign to @mention the handle and use #50percentoff, they could turn off the main @ mention filter for the duration of the campaign and instead create a Brand Keyword with “@sproutcoffeeco -#50percentoff” to filter through the noise. Many social media marketers are creating ad content to engage their audiences. Once you’ve created your ads, you can also respond to incoming comments on these posts for Facebook and Instagram. You can connect your Facebook Ad Account in Sprout (which does not count as additional profiles) to begin interacting with your ad comments alongside your organic content. Click the + icon in the top right corner of Sprout. Follow the prompts to connect your Facebook Ad Account. Engage with your new ad comments in the Smart Inbox, distinguished by the $ icon. Pro-tip: After connecting your Facebook Ad Account, you can also boost posts directly from Sprout, and track paid performance in Sprout’s Professional and Advanced Plans. While scrolling through your Smart Inbox, you may find a spam comment on your Facebook Page. You can delete or hide this right from your Inbox with this Sprout feature, which was recently released for Instagram as well! In the Smart Inbox, hover over the message you would like to hide or delete > click on the gear icon at the top right corner of the message. Pro-tip: You can find this feature on Sprout’s mobile app by clicking the three dots icon in the bottom right corner of the comment. While followers tagging their friends in a comment boost your brand’s visibility, these comments can crowd your Inbox. To save time, you can enable Complete @mention Comments in Inbox Settings. Pro-tip: Use Bulk Mode to quickly mark other messages as Complete. Message Tagging is a Sprout feature on Sprout’s Professional and Advanced Plans. With Tagging, you can customize your outgoing and incoming message tracking to best fit your social media goals. For example, you can track how many negative comments compared with positive comments you received on a particular post. You can also track how many incoming comments a campaign generates. In addition to incoming messages, you can track which posts or types of posts are performing best. 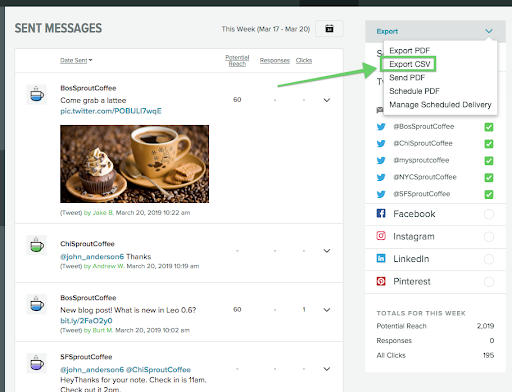 If @SproutCoffeeCo posts one photo of an iced latte and one photo of a hot latte each day on Twitter, the author can tag the outgoing post with either “iced” or “hot.” In the Tag Report, users can then compare which types of posts received the most impressions, engagements and clicks. View the Tag Report to track message volume and post performance. Pro-tip: On Sprout’s Advanced Plan, you can enable automated rules to auto-apply tags on specific incoming messages. 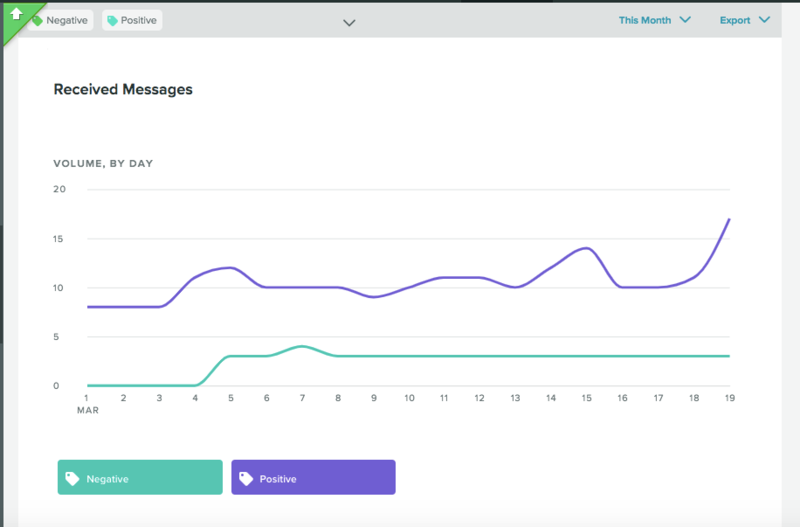 Sprout’s Sent Messages Report provides in-depth metrics on individual posts during the reporting period. To search through the report by any of the available information—including author, text and tags—export your report as a CSV. When opening the report, you can then filter by those columns or search to find a post. The export includes a direct link to the posts as well to view posts natively. For Facebook posts, you can discover additional metrics in the export, like Reactions separated out by type. Choose the network you would like to view in the right sidebar. Pro-tip: Twitter videos and photos include a link to the video or photo in the Message column of the export, which distinguishes these posts. Filter the Message column by “video” or “photo” to isolate media posts in the CSV. Between scheduling content, engaging with followers and reporting on your brand’s social progress, we know you have a busy day. These Sprout tips can help you do it all! Do you have a favorite Sprout feature to optimize your workflow? Let us know on Twitter at @SproutSocial.